We recently reviewed some of the elements from Mantic Games series Terrain Crate. 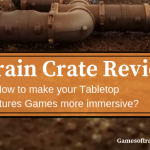 If you missed this article, I suggest you have a look at the terrain crate Review! As beautiful as the products are, this are some more of those grey bits of plastic. 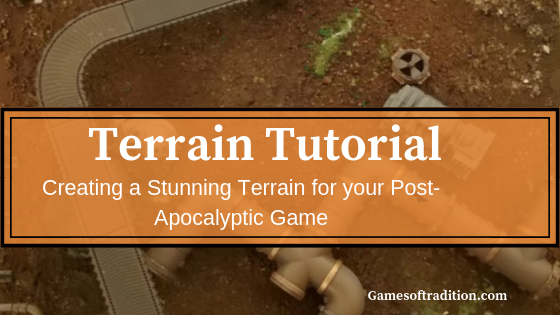 So let’s see how to use one of those boxes and make a stunning terrain to make your post-apocalyptic skirmish games more immersive. In this article, we will look how to turn the Industrial Accessories set into a stunning table. And you will see: this is an easy thing to do, and surprisingly quick too. So if you have kids, this is a perfect moment to introduce them to the hobby! Beware though, building your own terrain is really addictive! The Terrain Crate Industrial Accessories. A board of about 40cm x 50 cm. I used an old cupboard door, but it makes the whole set very heavy. You may use cardboard, but ensure to have a strong one, and probably 2 layers as the set may be heavy, you would not want it to fold as you move your art away from the table. If you can get some plywood, this will be the best option. PVA glue, and a brush to spread it. I use some standard glue for wood that I dilute with a bit of water. I use Tamya cement glue, that I purchased in a hobby store. Super glue would work as well. Hair spray lacquer, or spray glue. I use this to give an extra layer of glue on top of the sand. Simple sand, I use some left over from home refurbishment, that was used for cement. I used two different primers in that project: one is a car paint primer, you can find in any hardware shops. This type of primer is much cheaper than the one you would buy for minis, and I tend to find harder to paint details on top of it. The second is the Citadel Chaos Black, that I use on the surfaces I intend to paint later with more details. – Silver, non shiny, for the supports of the pipe elements. These are different types of artificial grass you may get from hobby store to base your miniatures. You will also see some “stones” on the terrain. These are made of self expending foam, that you may purchase in any hardware store that I primed black and highlighted with different levels of grey and white. You may also, but I have not yet, add some water – hobby stores have different products allowing you to create swamp area. And rust – there too, hobby stores have products that can help you get a rusty effect in no time. As with any model product, first start with cleaning every piece with a lukewarm water and soap. This will help your primer to adhere perfectly to the plastic and reduce risks of the paint chipping if the piece gets hit. You will then want to scrape the visible mold lines with a sharp tool – cutter or knife. Just make sure the pieces can align together. Once done, head outside as it’ll be time to use your rattle cans. Note: some tricks about rattle cans. First and foremost, shake it. Shake it well. Shake it more. This will help mixing the paint inside the can, and will allow you to have a nicer flow, and nicer results. Clean the top when you are done with it, it will avoid obstructing the flow next time you need it. Usually, a damp sponge is enough to clean. Lay all the elements on a flat surface – if using a table, protect it as paint will go everywhere. Separate any elements you would want to paint with more precision than others. Use your car black primer (ie cheaper primer) on the elements requiring less details, and you miniature blac primer (ie the more expensive one) on the elements to be detailed. Usually, when priming, it is recommended to stay at a distance from the elements, and press the can in short steady burst to avoid any big drops of paint. Once you have done this step, you will want to leave the pieces to dry. I usually give between 20 and 30 minutes to dry. 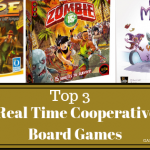 Let’s look at the board in the meantime. Spread some PVA glue all over the board. You may dilute the glue with a bit of water to ease the spreading – you may find some brushes designed for this type of glue in hardware stores. If the board is made of cardboard, go easy on diluting the glue with water: water and cardboard will often give signs of warping. Then, lay some sand on top of the glue. If your surface is bigger, you will want to lay some glue then sand then move to the next spot until the board is covered. The sand may be uneven, and there may be bigger grain of sand: this is ok, this will show more realism in the end. At this stage, I would recommend that you leave the glue to dry a little. Time to get back to the plastic elements. Turn them all, and repeat the priming session. There again, alternate your cheaper and pricier primers as you see fit. And time to dry again. Back to the board now. Take the cheaper primer and prime the whole board in black. Go from every angles. Keep at it. You now have a really black board, covered in sand. That looks like what we need.Take the English Red rattle can. Shake it, shake it. And prime you soil. This time, it doesn’t have to be perfect. Go from various angles, but here and there, make sure to leave some darkness to give a bit of shades to your board. Done? Great, let’s then move on to the Terrain Crate again. For this step, I decided to separate the pipe elements in one bunch, the rings in a second batch, the support for the smaller pipes in a third, and the track as a fourth. I left all the remaining elements to be painted later, with more details. Let’s go through few quick steps now. For all of these, just spray about 20 cm away from the elements and do not leave it uniform: every piece needs to be dirty in its own way, paint showing and fading. Starting with the tracks: currently black, I just sprayed, from far, some dark grey on the top. This gives some kind of a lighter highlight on the black primer. I then sprayed the rings, on both sides, with some gold. Then from farther back, a bit of copper and a bit of black and grey. I then added some silver and some grey on the support elements. The pipes are a mixture of dark brown, copper, grey and dark brown again. Go through these steps a few times, don’t forget to do both sides on the elements that show both sides while in play. Make sure not to leave any uniform strike of paint. Back to your board: if you have some artificial grass, put on some PVA glue in some places on the board, and sprinkle the grass. Vary the types of grass if you can, and do not overdo it: the world went to ruins, this is not a green field. If you have rock formation to place, do so. Sprinkle grass on it as well – after all, the vegetation tends to grow anywhere, does it not? Once you are done, spray some hair spray lacquer all over your board. Do no hesitate. This will help maintain the sand and the grass in place. Put some more. Make sure that lacquer or spray glue, it dries invisible. Well: you’re almost done now! Give a bit of time for the paint and lacquer to settle down and you are ready to bring your terrain home. Last step: use the miniature glue and build your industrial elements as you see fit. I glued most of the components together, but not all of them: sections of the pipelines can still be disassembled and rebuilt to accommodate new designs. It looks good, does it not? Now ready for the last step: put your Mantic Games build on your terrain. Et voilà! Tell us, what are you going to play now? And share pictures with us, we wanna see your build! Enter your email address to subscribe to this blog and receive notifications of new posts by email. Signup Now! We won’t or sell or spam your email. We promise! Men In Black / Ghostbusters – Ecto-Terrestrial Invasion.